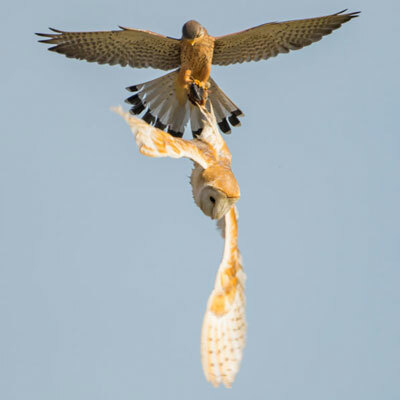 A photographer from East Anglia recently captured some amazing photographs of an unusual aerial hijack - a Kestrel stealing food from a Barn Owl on the wing! The audacious heist was recorded by photographer Chris Skipper over the Norfolk Broads near Wroxham. At first the Barn Owl seemed unaware of the intruder’s presence but before long the Kestrel was attempting to wrench the prey - probably a vole - from the Barn Owl's talons. There was a brief tussle and at one point they both had hold of the prey, but the kestrel eventually won the day. Not long after, Chris was able to photograph the Barn Owl out hunting again. If you’d like to see a selection of Chris’s other superb bird photography, visit his website here.